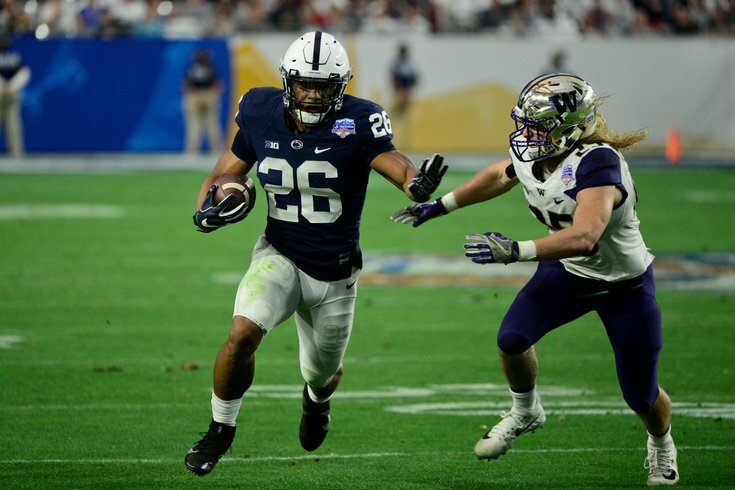 Nobody mocked Saquon Barkley to the Eagles, but thanks for clicking. On Thursday, we published our second Philadelphia Eagles-only mock draft of the offseason. Today we'll take a peek around at some of the national guys and see who they have going to the Birds at 32nd overall. The Super Bowl champions have the luxury of drafting for value, for a roster without many holes. Chark is a raw route runner but has the tools to develop. His stock is on the rise after a great Senior Bowl week and combine workout, punctuated with a 4.34 40 and 40-inch vertical jump. He could fill Torrey Smith's role as an explosive vertical WR in the future. #JimmySays: Meh, Joe Douglas has shown that he doesn't chase workout warriors. #JimmySays: Corner isn't a big need, but Jeremiah hits it on the head. Who cares? Just take the best player. If that's Oliver or whoever, so be it. The Eagles would love to add a slasher with big-play talent at running back, and that is exactly what Jones would provide. #JimmySays: Yep. Jones would give the Eagles a home run threat to add to their stable of bigger backs. #JimmySays: The pick is fine. I'll just nitpick here by saying the Eagles aren't going to "lose" Dannell Ellerbe. He's just going to sit in limbo in free agency. The Eagles' secondary did an excellent job at tackling -- and not permitting big runs after the catch -- last season. Jackson adds his talents to the mix, and he can play inside, as well. #JimmySays: Jackson is probably the fastest player in this draft class. In 2017, he had just 6 missed tackles on 52 tackle attempts, per cfbfilmroom.com, which is good for a corner. Depending on what cuts the Eagles have to make (Torrey Smith? ), it wouldn't be surprising to see them chase a little speed in the draft, especially if a guy like Kirk lands here. #JimmySays: Yep, I agree that Kirk would be another piece that would fit the Eagles' offense, and he brings elite return ability as well, which is a big need. The Eagles might have the best roster in football. They're going to lose some guys this offseason, though. Super Bowl champs always do. The strength of this team is its defensive line, and taking Bryan would help ensure that remains the case next year and beyond. #JimmySays: The Eagles added Michael Bennett via trade, thus helping solve their DT depth to some degree, as Bennett can play on the interior on passing downs. The Eagles still could use added DT depth, however, and Bryan is a disruptive player. The Eagles take a chance on the inconsistent Williams to potentially be their long-term answer at left tackle. The former Texas tackle was outstanding in 2016 but his play fell off last year. However, he put up great athletic testing numbers at the combine, and it would be surprising if he doesn't hear his name called on Thursday. #JimmySays: I think the Eagles would be thrilled if Williams dropped at 32. He's a great player at a premium position, however, so I don't see it. They have to get ready for when Jason Peters isn't around. Williams would bring great value here. #JimmySays: Are the CBS guys copying answers from each other? Can Williams possibly fall here? Crosby is a compact, mobile offensive tackle who'll thrive in Philadelphia's zone running scheme. He's a solid choice to be Jason Peters' heir apparent. #JimmySays: I'm a bigger fan of Crosby than most. He's a mauler in the run game and puts defensive linemen on their asses. With LeGarrette Blount and Darren Sproles headed for free agency, Guice, who has drawn comparisons to Marshawn Lynch, would seem like a natural fit. Yes, Jay Ajayi and Super Bowl hero Corey Clement return (along with Wendell Smallwood) but as Blount proved in 2017, you can never have too many talented backs in a game where injuries can derail a season. #JimmySays: I like Guice for the same reason as Ronald Jones above. Not sure I agree much with comping anyone with Marshawn Lynch, who was as unique as they come. Jason Peters is 36 and only lasted seven games last season. Philadelphia would be wise to begin eyeing a next-gen blind side bodyguard for Carson Wentz. #JimmySays: I'm a big O'Neill fan. Big time athleticism. The Eagles might not be able to afford re-signing Patrick Robinson, who will be a hot free agent after dominating opponents in slot coverage last season. Jackson sticks well with receivers on intermediate routes and has a nose for the ball, lining up well for him to be an impact nickel back. #JimmySays: Jackson had something of a disappointing Combine, so we noted him as a player who could fall to the Eagles if teams overvalue Combine numbers. Corner isn't a need, but if I were the Eagles, I'd be perfectly happy snatching up Jackson here. Penny is a big back with power, speed and return skills. Doug Pederson seems to like a bevy of backs at his disposal so why not add another to the mix? #JimmySays: I like Penny, but no. To note, they had the Giants taking Mike McGlinchey at pick No. 2 overall, lol.